As we know Microsoft guys were released their latest Operating system Windows 8,Which actually more compatible with the Touch Screen's and Tablets. They had made a Start Screen alternative for Start Menu in it. But for Desktop users it feels like annoying. In order to power off or to get control panel you have to do a lot of clicks instead of one in the old Start Menu. I think it might be better to get our old start menu back in Windows 8. 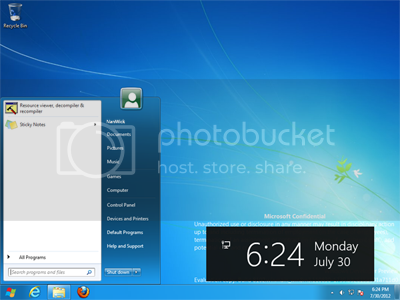 [Update] Microsoft had released three builds of Windows 8 without start menu currently. But this will work only in Windows8 Developer Preview only. 2. Once it opens type "regedit" (without quotes) and press enter. It'll open windows registry editor. 4. In right side pane check for the key "RPEnabled". Double click it and change it'svalue to 0. 5. Restart your explorer to see the change. you can revert back to default by changing the value of the key to 1. Posted by Unknown at 21:36 12 comments so far. What are your thoughts? Posted by Unknown at 23:51 9 comments so far. What are your thoughts? 3. Once you download it Unzip using 7zip (Other archive utilities show file corrupted message while extracting) and start it. 4. On Windows 7 Video boot main window insert a video file by clicking Browse Video File button. and press Set to apply it as Windows 7 boot screen. 5. Reboot your PC to view the new boot screen. Posted by Unknown at 20:17 5 comments so far. What are your thoughts? Previous day we had a discussion about Enabling Windows 8 Developer Preview Logon Screen In Windows 7. Some of our readers reported it looks so ugly. Posted by Unknown at 22:47 7 comments so far. What are your thoughts? We all know Microsoft had released Windows 8 Release Preview for public and available for download. If you are not heard about it download using following link : Download Windows 8 R P.
Windows 8 is coming with new logon screen which is simple and clean. It doesn't contain any animated background image or styled user image frame. 1. Download Windows 8 Logon Images using following link. Unzip it using 7zip or any other archive manager. 3. Unzip and start Windows 7 Logon Editor v2. (i) Click Browse Button under branding logo. Once the branding logo window appears click browse button and locate Where you are Unzipped Windows8LogonImages.zip, Select Branding_Logo.png and press Apply. (ii) Now click Customize button under User Image frame. On the User image frame window Browse and select User_Image_Frame.png then Press Apply. (iii) Then click Select Background Image button and select bg.png. (iv) Click Customize button under Shutdown Button. In Shutdown Button Window Browse and add Up.png, Over.png, Down.png, Logo.png included in folder "Shutdown Btn" respectively in Up,Over,Down and logo group boxes. Apply it. Before closing it Browse and select Shutdown options Images also included in same Folder. (v) Now click Customize button under Go Button. In Go button window Browse and select Up,Over and Down Images included in folder "Go Btn" and press Apply. (vi) Click Customize button under Ease of access. Do the same procedure which is done in customizing shutdown button. Images are included in "Ease of access Btn" folder. 4. Close Windows 7 Logon Editor v2 and Reboot your Pc. Watch live preview of customizing logon screen. Please share your valuable feedbacks as comments. Posted by Unknown at 00:47 11 comments so far. What are your thoughts? 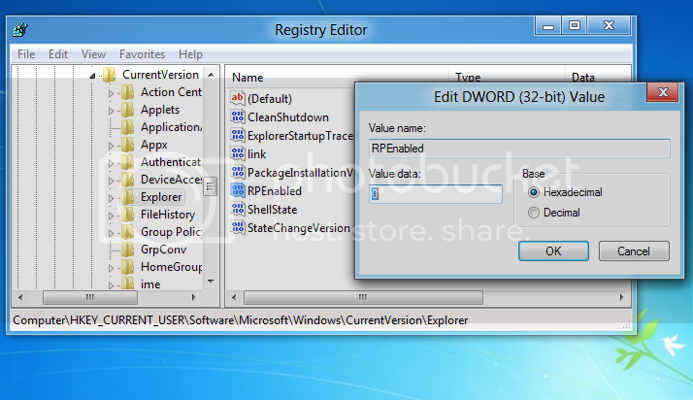 Today we are releasing the updated version of our tool Windows 7 Logon Editor. Customize Ease of access button. One hot button to restore all settings to default, which helps you to remove all customizations you have made. Share your feedback about this tool and don't forget to report if you have found any bug in this tool. Posted by Unknown at 21:47 33 comments so far. What are your thoughts? Today I would like to share a new tool which helps you to start your favorite applications at your logon screen itself.I think sometimes this tool might be a blessing that at Logon screen you are free from firewall and antivirus. 1. 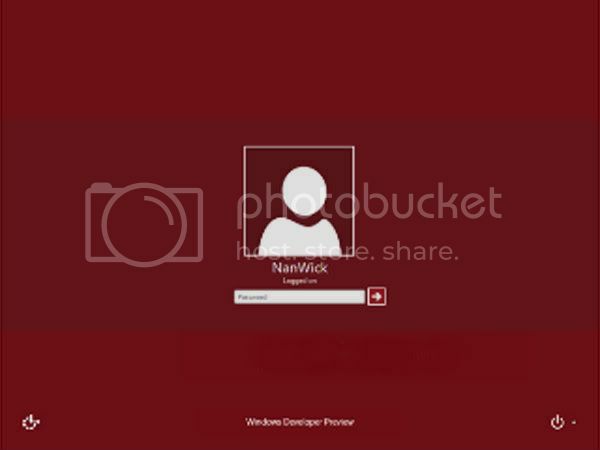 Start NanWick Logon Toolkit and click Enable button. 2. Log off or Restart your Computer. 3. On the left bottom part of your Logon Screen you can see a button (Fig 1). Click it. 4. The application window will be opened. Most useful Windows applications are included in the Main window. Actually this tool is replacing you Ease of Access menu at your Logon Screen. Before Enabling NanWick logon toolkit, When you press Ease of access button it opens an application named Utilman.exe Located in C:\Windows\System32 directory. Posted by Unknown at 03:49 8 comments so far. What are your thoughts? 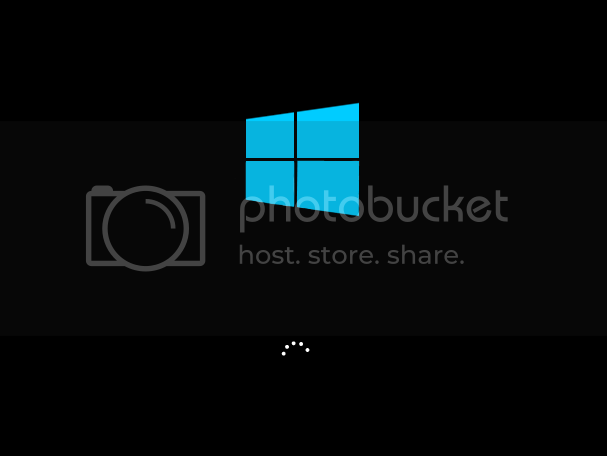 Microsoft released Windows 8 RTM for public . Which can be downloaded here. Actually Windows 8 contains Dot net framework 4, But for applications developed in Dot Net 3.5 requires a framework of same version to run.Windows 8 allows users to enable this feature through internet. But it consumes so much time since the size update is about 230Mb. The interesting thing is that actually the Windows 8 DVD contains Dot Net 3.5 Update setup but you can't use it directly. Which can only be used through cmd. Update : This method is applicable to all Windows 8 Editions including RTM. 1. Insert Windows Developer Preview DVD into your drive. 2. 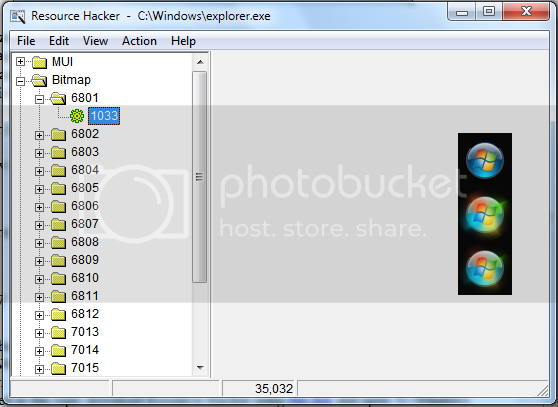 Go to "C:\Windows\System32" and find cmd.exe. 3. Right click on the file and select Run As Administrator. Change Z with your DVD RW Drive letter and press Enter key. The process may take several minutes to finish. Restart your PC after the completion of the process. Posted by Unknown at 22:56 68 comments so far. What are your thoughts? 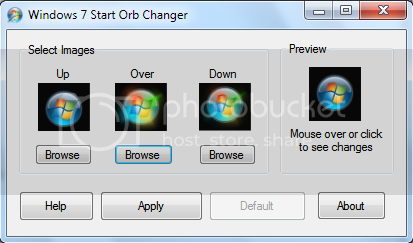 NanWick is releasing a new tool to customize Windows 7 Start button (also known as Orb). 1.Select three images using the Browse button. 2.Click Apply to apply it as start button. If you are not satisfied with the new button and you want to restore original Orb then click the Default button to restore original Orb. It might be better if the images are of resolution 54x54 pixels and the image lies in the center. This is only the first build of this tool and we need your feedback to make more changes on this. Actually What Happens Behind ?? 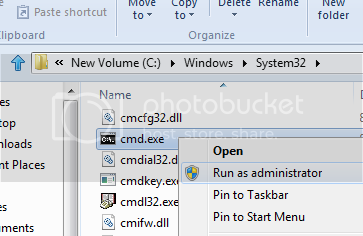 Windows 7 Start button resources are stored in "C:\Windows\explorer.exe" (Drive letter may be changed if you have installed Windows in another Local Disc). It can see through resource editing software's like Resource Hacker. This software creates a similar image using the images which you are selected and replaces these resources in "C:\Windows\explorer.exe". If you are an advanced user you can do it manually. Posted by Unknown at 02:04 6 comments so far. What are your thoughts?